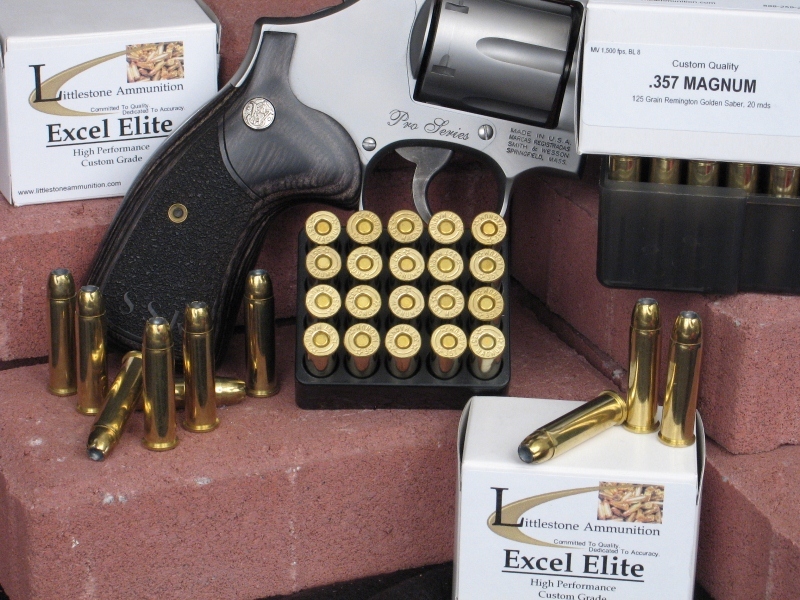 Twenty- and 50-round boxes of Littlestone Ammunition's loading of the .357 Magnum cartridge with 125-grain Remington Golden Saber Brass-Jacketed Hollow Point bullets. Hover cursor or click on photo for close-up view. Firearm not included. When your life, or the lives of your family, is at stake, why shoot anything other than the best ammunition you can get: Littlestone Ammunition, true Custom-Quality ammo you can count on when you need it the very most. These 50 rounds of Littlestone Ammunition?s loading of Remington's 125-grain Golden Saber bullet are great defensive rounds, leaving the muzzle at 1,500 fps and packing 625 ft pounds of energy. The Golden Saber is Remington?s offering for law enforcement and personal defense use. This hollow point bullet has some unusual features Remington suggests produce superior performance. Unlike most jacketed bullets in which the jacket is a copper alloy, the Golden Saber jacket is pure brass, which is said to release energy over a longer distance while mushrooming. Additionally, the skives on the hollow point jacket are cut in a spiral rather than straight down, said by Remington to allow mushrooming at a lower velocity. Additionally, this bullet offers match-type accuracy and deep penetration, while providing maximum penetration and nearly 100% weight retention. Feature 3: MV / Energy / Barrel: 1,500 fps / 625 ft lbs / 8"